Local allotment sites have waiting lists, but you don’t have to wait to grow delicious veg, because Planet South Bank offers a solution – community gardening; a group of local people growing food together, and sharing the produce amongst themselves and other locals. 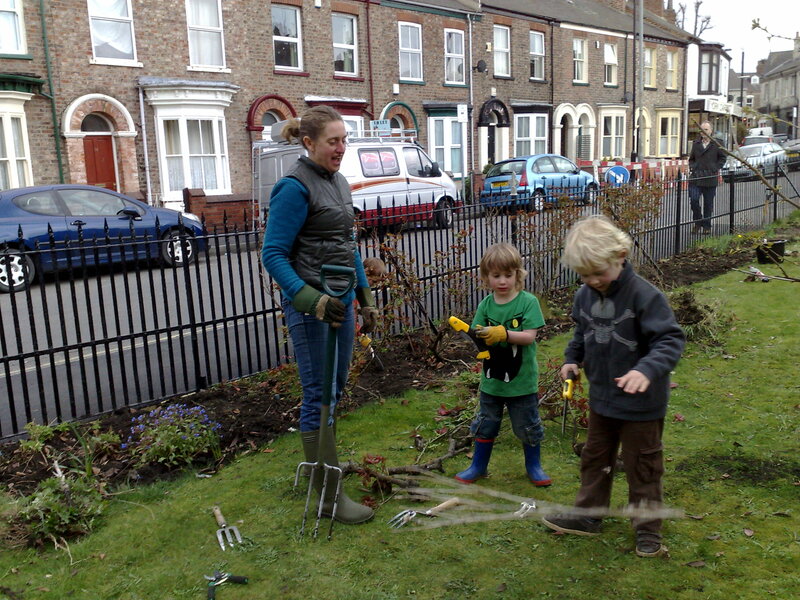 Planet South Bank worked with St Clements Church and with Edible York to transform land at the church on Scarcroft Road, from grass and (elderly) rose bushes, to fruit, veg, herbs, edible flowers and beautiful polinators. Edible York’s beds were in the paper, in an article that mentions our plot. In 2011, our first year, we grew ‘a bit of everything’ along the borders, with cabbages mingled with courgettes, coriander amongst the carrots. Tomatoes grew well against the warm church walls, surviving late frosts, despite having to go in early. Two new beds were dug, which were mainly taken up with potatoes, and these beds were then over-wintered with a covering of green manure. Since then, we’ve added more beds and now we have four beds in the middle, as well as others around the outside of the plot. Regular gardening sessions at St Clements Church: Sunday afternoons, twice a month (1st and 3rd Sunday at 2pm). All are welcome – come and join us or call by for a chat over the fence. We can also arrange to meet you for gardening at other times. Leave a message here, or email us on thenose@planetsouthbank.org.uk. At St Clements, we have gardening spades and forks, and hand tools, which are available when we have our sessions or by arrangement at other times. It’s so nice to see the community coming together to help out like this, I’m sure it’ll produce a fantastic garden!